This is one of the best aspects of gun ownership IMO. You, nobody else, YOU get to choose how you want to “trick-out” your weapons. Since I love to make furniture, I would think nothing of plunking down 1K for a quality made oak, maple, mahogany, or other exotic hardwood, stock with a one of a kind engraving by an artist of this caliber. Even if the engravings are stock or templated if they are done by hand they will all be just a little bit different and when you are talking about that kind of money customers have a BIGTIME say into what will be engraved. If I ever have that kind of money to blow on a stock I will send you guys a picture! An $1100 stock on a $400 shotgun? You gotta be kidding me. Consider a custom rifle built on a war suplus Mauser 98 action. You can get a Mauser 98 action in good shape for… oh, $200. Put a $1200 stock blank on it, inlet & carve the stock from said blank (which looks like a really thick plank), then polish the action & bottom metal, shape the trigger bow, jewel the bolt, engrave the magazine bottom plate, put on a custom barrel, etc, etc etc… and in a few months, you have a rifle that sells for north of $5K to $8K. From a war-surplus action that cost you $200. Maybe the whole surplus rifle cost you $250. Really pretty work. 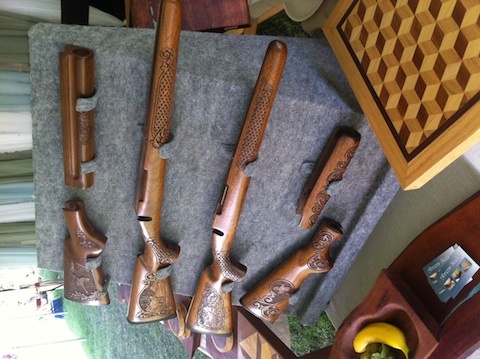 The cost is high but look at it from an art stand point not a gun stand point. Tyler, if you’re impressed by that, you would be blown away at some of the stuff at the Dallas Safari Club conventions. One stock maker had a M1D Garand sitting in a fully engraved Mesquite burl stock. I can’t even remember the number of zeros on the tag…..
Are you telling us that you’ve got “wood” over these stocks, so to speak? My advice before spending so much $ on the least functional part of a (much cheaper gun–to Ralph’s point), take a cold shower and then dab some Hoppes #9 behind your ears. The feeling should pass. Or, save the $ not buying a carved stock and put it towards a better optic. Sounds like me, getting ready for a date.